This experiment will let you perform a series of simple quantum computations on a two spin system, demonstrating one and two quantum-bit quantum logic gates, and a circuit implementing the Deutsch-Jozsa quantum algorithm. 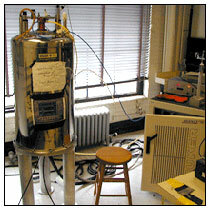 You will use NMR techniques and manipulate the state of a proton and a carbon nucleus in a chloroform molecule, measuring ensemble nuclear magnetization. optionally, the output and oscillatory behavior of the Grover quantum search algorithm. David Deutsch, "Quantum theory, the Church-Turing principle and the universal quantum computer", Proc. Royal Soc. London A400, p97, 1985. David Deutsch, "Quantum computational networks", Proc. Royal Soc. London A425, p73, 1989. I. L. Chuang, L. M. K. Vandersypen, X. L. Zhou, D. W. Leung, and S. Lloyd. "Experimentalrealization of a quantum algorithm". Nature, 393 no. 6681 pp. 143-146, 1998. Neil Gershenfeld and Isaac Chuang, "Quantum Computing with Molecules", Scientific American, June 1998.